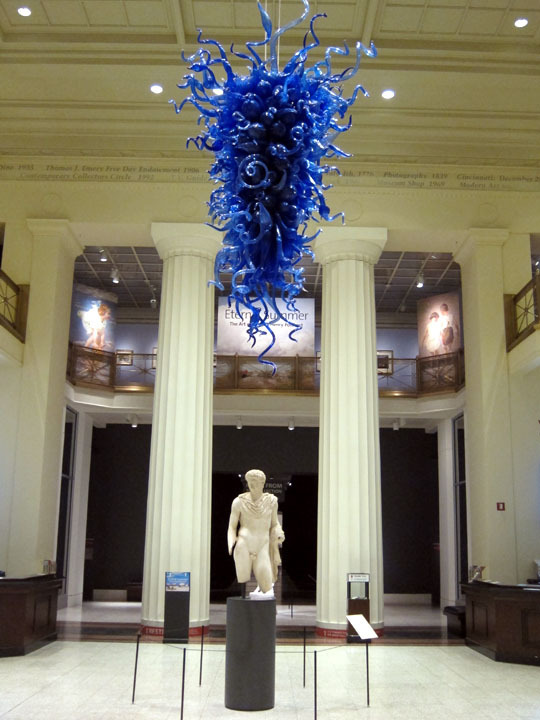 When the first thing you see inside a museum is a Chihuly hanging over a classical male statue, you know that you’re in for something good! I wandered into the the Cincinnati Art Museum with no expectations. I’d forgotten to check their collection ahead of time and I didn’t know what the special exhibits were. I ended up having what was probably one of the funnest museum experiences I have ever had! The programing, creative presentation of their art and friendly staff were so impressive that I left at the end day totally floored and a new fan of the Cincinnati Museum. It is fairly easy to just hang art. Where a museum proves itself is the ability of its staff to arrange and present its works in an thought-provoking way. Earlier this year, I wrote about how San Diego’s three major art museums did a good job constructing thematic exhibits from their permanent collections. The Cincinnati Art Museum has very creatively considered how to present their pieces which made for a really fun experience filled with a legitimate sense of discovery. 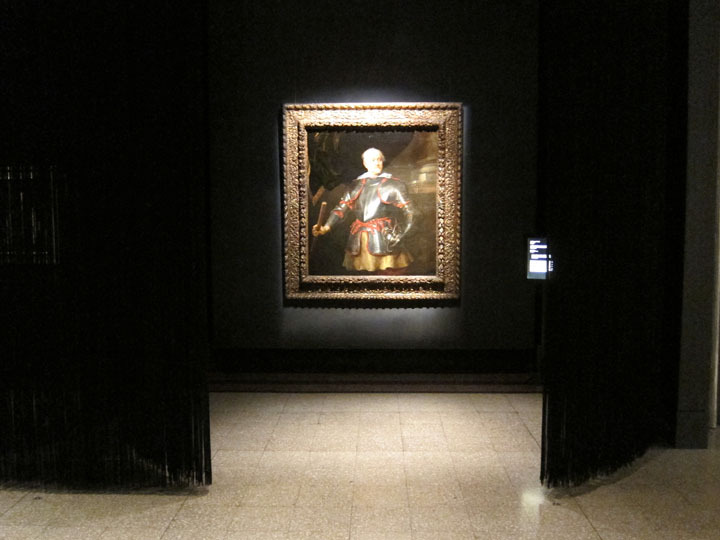 The central passage of the gallery houses the “Masterpieces” of the collection. 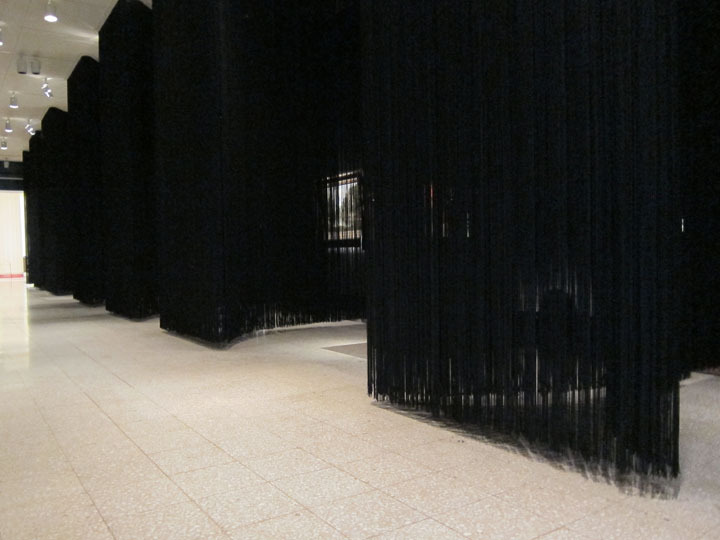 Each piece is dramatically spot-lit and enveloped in a cocoon of hanging black cords. I have never seen anything like this. 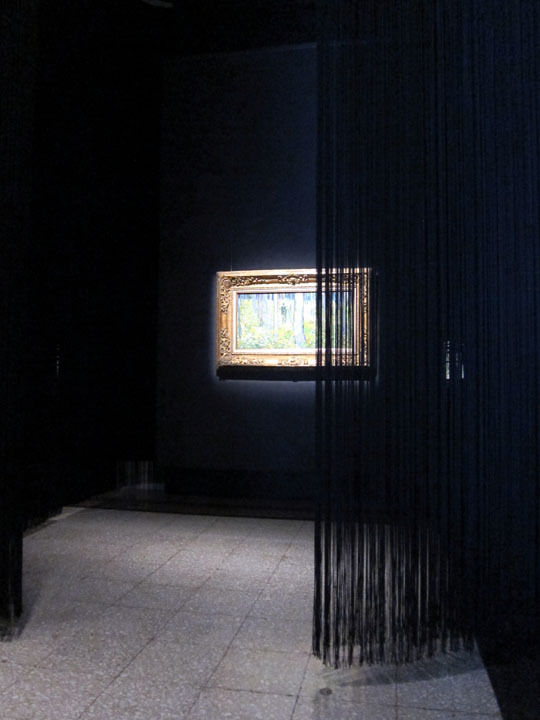 Since some light passes through the forest of cords, there is a sense of intimate enclosure and isolation with the masterpiece without being in a restricted viewing stall. Somewhat distracted by the novelty of the setting, I ran my hands through and leaned into the cords while the smiling security guard looked on. The painting bays were shaped by hanging cords. A forest scene by Van Gogh in the hall of masterpieces. I loved the exhibit entitled “The Collections: 6,000 years of Art”. Recognizing that there are lots of treasures in the collection that can’t be properly displayed, the Cincinnati Art Museum has created an “open storage” exhibit. Two large galleries are packed with sculptures, paintings, decorative objects and furniture. 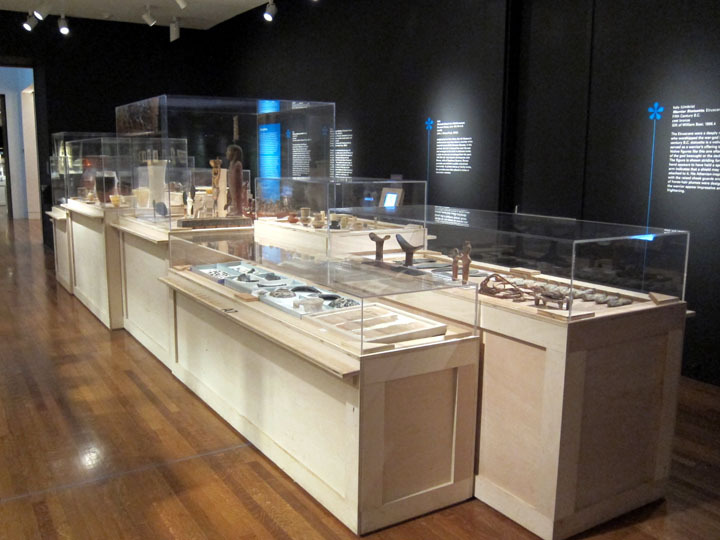 The display cases were mostly chronological and displayed on wooden crate-shaped pedestals – a nice homage to the storage theme. The paintings are hung as mishmash of genres, periods and styles. I loved this! Sometimes you just want to contemplate a portrait of the Holy Family and a 20th monochromatic century study. It’s not museum sacrilege; it can be really fun! Signage is difficult in this type of display but it forces you to just look at the paintings and evaluated them on appearance alone, rather than named artists and historical notes. 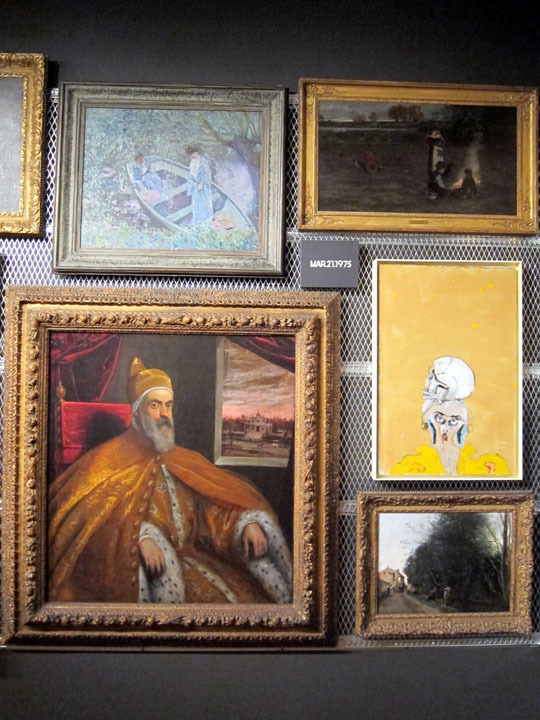 I first saw this concept of open storage galleries at the Metropolitan Museum of Art and I loved it there too. I’m glad to see the Cincinnati building on that exhibit design concept. A doge, an impressionist boating scene, country landscapes and a yellow Egon Schiele-like head with a skull. 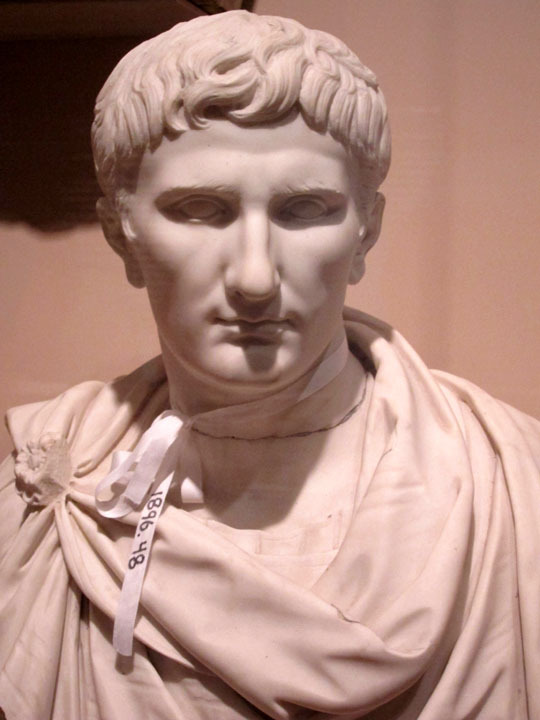 This Roman portrait bust of Augustus would normally be stored with the accession number of the piece on a ribbon around the neck and so that is how it is displayed for “open storage”! 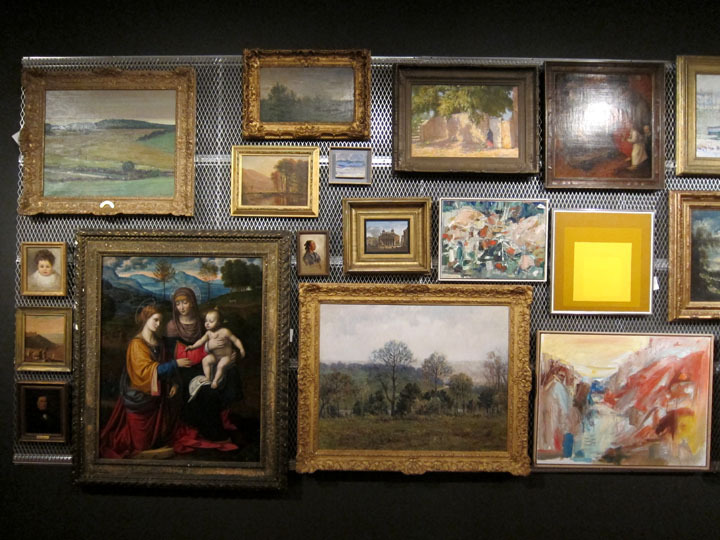 Contrasting paintings in the open storage exhibit, “The Collections: 6,000 Years of Art” at the Cincinnati Art Museum. In general, the museum was very well laid out and presented. The main collection touched a broad spectrum of Western Art. I particularly liked a room of contemplative American paintings by Andrew Wyeth, Edward Hopper and Grant Wood. 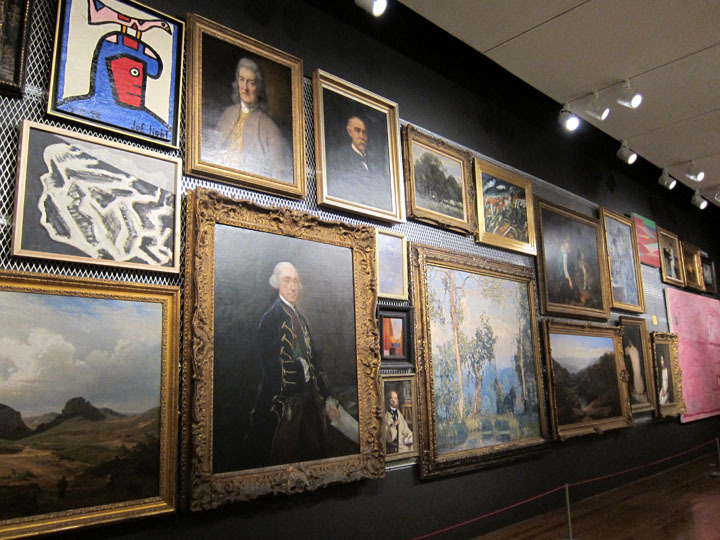 Interspersed throughout the collection were small signs connecting a piece in the main collection to one of the masterworks in the central gallery. The viewer was asked to compare the two pieces with some discussion questions. My favorite pairing was a 18th century British military portrait and a statue of Shiva. 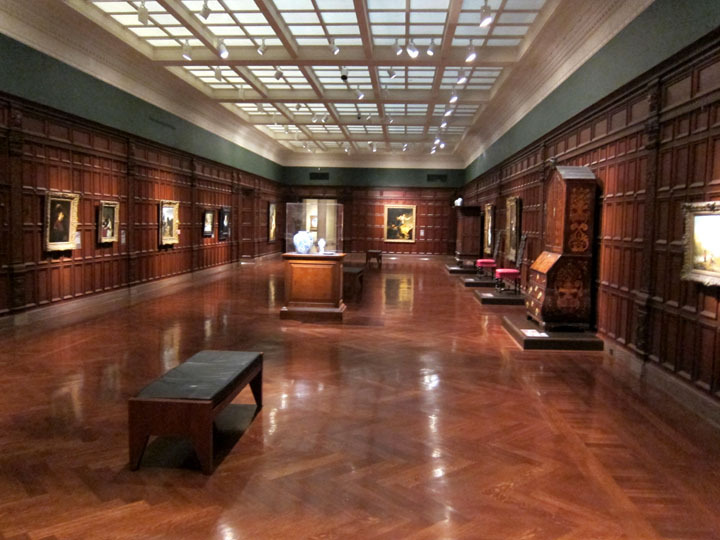 The Dutch Galleries had warm wooden paneling and flooring without being a dark space. 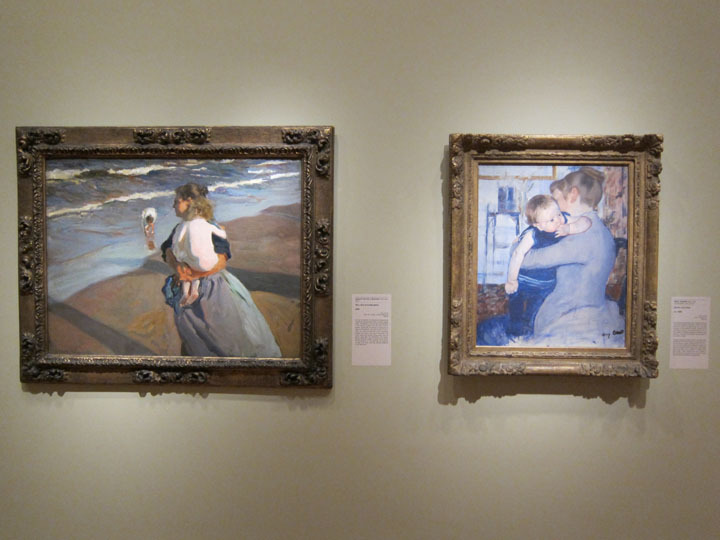 These mother and child paintings by (left) Joaquin Sorolla y Bastida and (right) Mary Cassatt were clearly put together on purpose. Cincinnati is the historic home of the famous Rookwood Pottery company. Founded in 1880, this company has produced some of the most beautiful Art & Crafts ceramics in America which still yield significant prices at auction. 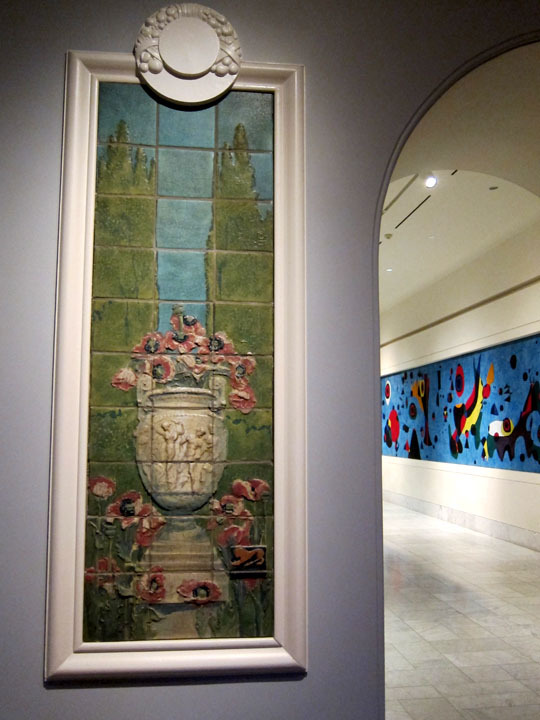 It’s not surprising then that the Cincinnati Art Museum would have an excellent collection of pottery and some of the more impressive pieces created by Rookwood, plus works by other local artisans. As someone who as always considered Rookwood a vase maker, it was great to see decorative panels for hotels and domestic commissions. 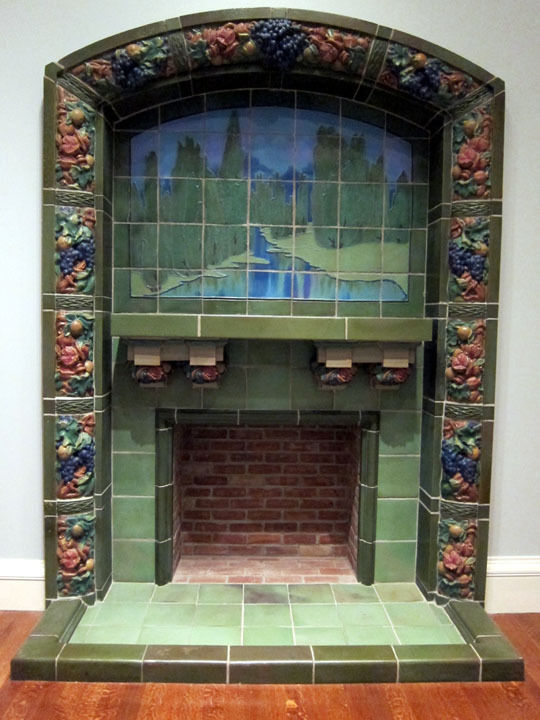 A custom Rookwood Chimneypiece commissioned for Christian & Betty Holmes in 1903. The Spring panel from “The Four Seasons” created in 1907 by the Rookwood Pottery Company for the Grand Cafe of the Hotel Sinton in Cincinnati. In the background you can see a Miro mural in the regular museum collection. The night I went to the museum it was open until 9pm as part of their summer hours. What I didn’t realize was that summer hours entail a bit of a party. In the center courtyard of the museum there was a modern blue-grass group playing American folk museum. (Cincinnati does border Kentucky after all.) There were also free snacks, a cash bar and a crowd of young professionals taking it all in. The music echoed through the museum and created a great viewing atmosphere. I almost felt like we’d broken into the museum and were having a party! 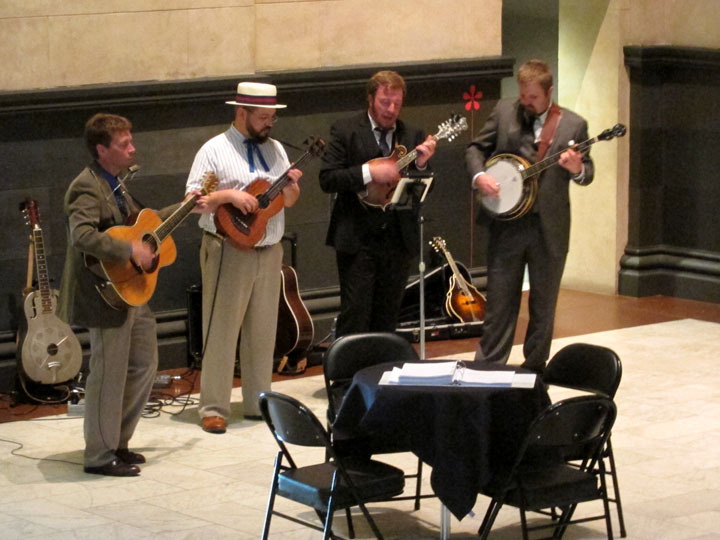 Event music by The Goodle Boys, an Old Timey / Americana / Bluegrass group. 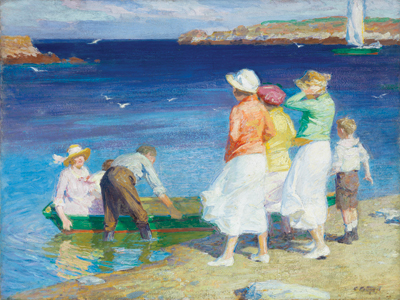 The special exhibit for the summer were works by American Impressionist and Cincinnati-native Edward Henry Potthast. His breezy, colorful beach scenes filled with children were perfect for an August evening. Since I didn’t know this artist, I was happy to learn about a clearly talented American painter. Beach scenes by American Impressionist Edward Henry Potthast. If you find yourself in Cincinnati, then by all means get to the Cincinnati Art Museum! Beside being run by smart and clearly fun people, admission is free year round thanks to several generous contributions to the museum. Thanks for the reminder – haven’t been there in ages! Love the open storage concept – haven’t seen that before. Looks like you had a great visit! Thanks! I had a great trip. Enjoy your visit.